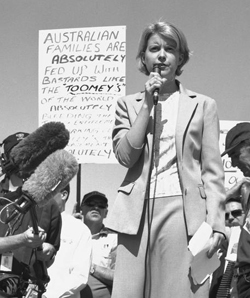 Natasha Stott Despoja AM is the founding Chairperson of Our Watch (the Foundation to Prevent Violence Against Women and their Children). She has been Australia’s Ambassador for Women and Girls December which involved 45 country visits between December 2013 and 2016 to promote women’s economic empowerment, women’s leadership and reduce violence against women and girls. She is a member of the World Bank Gender Advisory Council and, currently, sits on the UN High Level Working Group on the Health & Human Rights of Women, Children and Adolescents. She is a former Senator for South Australia (1995-2008) and former Leader of the Australian Democrats. In 2011, Natasha was made a Member of the Order of Australia for her service to the Australian Parliament, education and as a role model for women. She is still the youngest woman ever to enter the Australian Federal Parliament. In 2001, she was made a Global Leader for Tomorrow by the World Economic Forum. Natasha has held the positions of Australian Democrats’ Leader and Deputy Leader and is the longest-serving Democrat Senator in the party’s history. Natasha is an Honorary Visiting Research Fellow at The University of Adelaide; a columnist for The Adelaide Advertiser, and was a guest panellist on Channel 10’s The Project. She is a former Deputy Chair of beyondblue, a former Burnet Institute Board member (now Patron); served on the board of the South Australian Museum (SAM) (2009-2013), the Advertising Standards Board (ASB) (2008-2013) and the Museum of Australian Democracy (MOAD) (2010-2013). She is a member of the Australian Privacy Foundation Advisory Board and the Global Women's Institute Leadership Council. She has been Patron or Ambassador for a number of not-for-profit groups including The Orangutan Project; Ovarian Cancer Australia, and ENUF the HIV/AIDS anti-stigma campaign. She lives in Adelaide with husband Ian and their two children Conrad and Cordelia.